The Missouri rental agreements are written and agreed upon a landlord, owner of property, and a tenant, lessee of space, for a period of time in return for payment. The funds are usually delivered by the tenant to the landlord at the beginning of the term and on the first (1st) of every month depending on what is agreed upon. The landlord, before accepting the rental arrangement, will usually ask to verify the tenant’s credentials through a rental application. Rental Application – Form given to a potential tenant, along with a small fee, to run credit & personal background checks in addition to verifying references. Apartment Association of Missouri Lease Agreement – For any standard fixed term housing arrangement. Commercial Lease Agreement – For any business-related use such as occupying retail, office, or industrial space. Lease with Option to Purchase (Lease to Own) Agreement – Standard residential contract with language providing for the purchase of the property if the tenant chooses to buy. Month to Month Lease Agreement – Known as a tenancy at will and should be written according to Section 441.060 providing at least one (1) month’s notice to cancel at any time. Room Rental (Roommate) Agreement – For individuals sharing common areas within one (1) dwelling. 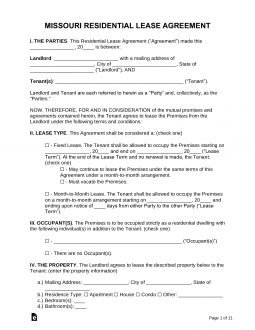 Standard Residential Lease Agreement – Typical fixed term arrangement. Sublease Agreement – For the purpose of a tenant that is legally bound to an existing arrangement with the landlord and would like another individual to fill-in and pay rent until the end of their term. Termination Lease Letter – Cancels a month to month agreement according to Section 441.060 by providing at least one (1) month’s notice. Missouri landlords do not have any State required disclosures to give to tenants at the time of occupancy. Inventory Checklist – Not required but recommended for all tenants that have paid a security deposit to the landlord to ensure that it is protected from wrongful charges. Lead-Based Paint – Required by any landlord, per federal law, whose housing unit was built prior to 1978. There is no statute that requires the landlord to give the tenant notice before entering the property for any non-emergency reason. Maximum (Section 535.300) – Two (2) months’ rent. Returning (Section 535.300) – Within thirty (30) days of the termination of tenancy by the landlord the deposit must be returned to the tenant.